Bedrich Schnirch. The first suspended steel roof. I have been thinking about posting another recipe of a granola but then I have decided to write about more interesting topic this evening. I have noticed that I have not written about anything serious in a long time. Finally, a perfect idea crossed my mind yesterday. A lot of you guys liked the article on the folk architecture in Cicmany [link] and I thought I will do another piece on something very close to my heart. In the course of my studies, every time I attended a class where we were supposed to compose a paper, I have always been asigned to work on a topic with case study in Slovakia. To be honest, it is not an easy task to do especially if you have spent your college time aborad. I would usually have to look very hard to come up with something interesting. I have recently took a class ‘Design in existing context/ Renovation and alteration of architectural heritage’. It was a very interesting subject and I have learnt a lot about the industrial heritage – suspension bridges from the end of 19th century in particular. Anyway, I was supposed to write a short paper concearning a related topic. My problem was, Slovakia used to be quite agricultural land and the industrial revolution arrived very late, so I was short on interesting objects. There were no preserved suspension bridges to write about. However, I have accidentally stumbled upon an engineer Bedrich Schnirch and the rest of the paper came together very easily. Bedrich Schnirch (in German literature Friedrich Schnirch, 1791-1868) was a czech engineer, inventor, and architect. He is known for designing the first suspended bridge on the european land as well as designign the first suspended bridge for a railway traffic. However, only few sources mention his work on the field of suspended roof constructions, neither do they mention his patent of a chain roof form 1826. Schnirch started designing and building bridges in Czech Republic, it used to be a part of Austria-Hungary back then, just like Slovakia, and later on moved to Vienna. The most of the bridges he had designed have been replaced over the time but there is one last from 1847 in Podolsko. It has been translocated to a new place, Stadlec, in the 1980s but it is still in use. Considering the slow progress of industrial revolution in Slovakia, the time Schnirch has been working on his significant projects, all his structures vere build exclusively out of wrought iron. The first puddling oven in Slovakia has been put into use in 1839. So, in his early projects, Schnirch was definitely using handmade steel parts. In the paper written on 10/1824 he describes several parameters of those emelents, e.g. the thinner the part was, the better strength the material performed in the experiments – comparing the determined overall tensile strenght of the mateial. The article (in German ) is looking at a hypothetical construction for a theatre, covered by a chain-roof, presenting a contemporary calculations concearning its load bearing behaviour. It is questionable, wheather was Schnirch fully aware of the Navier´s theoretical work on suspended construtions composed in 1823  when composing this article. It could have been based on his own experience aquiried during planing and construction the bridge in 1823-24 in Staznice, span 29.71m. Nevertheless, Schnirch introduced here the term suspended roof construction and has also registered a patent on the small chain-roofs. He presented this solution as a fire-resistant construction, as it would withstand fire for much longer than just a plain timber skeleton. According to the literature, by the end of 1820s, this solution has been implemented on five/six objects – Straznice, Tuřany na Morave, probably two structures in Český Brod and two in Banska Bystrica. The first prototype has been designed in Banska Bystrica in 1826. There have been found original plans of two buildings in archive in 1960s and afterwards have found one of them still standing. There have been released some short publication back then concearning this great discovery. However, the most publication – except for The Oxford Dictionary of Architecture :), do not recognise Schnirch as an inventor of suspended roof constructions. This one object is acctually still standing there and hundereds of people are walking by every day, not noticing. The house has been originally constructed in 15th-16th century, yet in 1826 it has got a new roof covering area of 12.4 x 25.6m. All in all, 26 chains in the distance of appx. 49.5cm are ankered in the facades and deflected over a two gothic masonry arches in the middle. Each chains is composed of 5 segments made out of crubicle steel with min. 0.8 x 2.5cm (1/3 Zoll x 1 Zoll) . The axonometry shows the load bearing principle and the main construction components. These have been added to the historical substance from 15-16th century in 1826. 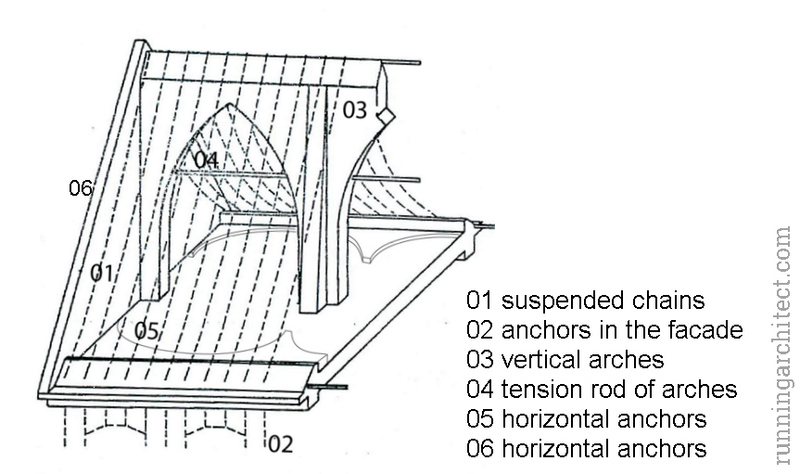 Vertically, the tensile force from chains is anchered into the facade which is balanced by its dead load. These anchors can be seen in certain areas underneath the plaster. The horizontal share is being distributed into the walls through additional horizontal arches built upon the ceiling. The diverting is being carried out by two gothic arches built in masonry, these have additional tiebacks from flat-steel-profiles. The ethernit tiles has replaces the original roof coat and during this reconstruction, a wooden substructe has been added as well. The original roof coat has been built out of cast-iron elements – some of them have been found on site and documented (by third party). However, there are no available measurements. Looking at the holes, where the original wires have been attached to the main chains, an appx. 14,6 cm (equals ca. 5,5 Zoll = 14,487cm) interval has been noticed. On those, Schnirch proposed to hang cast-iron elements of 55 □ Zoll in his article and a sketch presented a rectangularly shaped tiles. So we could come to e.g. 10 x 5,5 Zoll (26,4cm x 14,5cm) big tiles which were overlaping by half of the length. For more vivid image, make sure to click through the gallery attached below. I have left out the structural analysis on purpouse as this article is not supposed to be too scientific. However, if you are interested in more details please let me know so in the comment section. All in all, I have been fascinated by the simplicity of the structure and its good condition. It has passed about 160 years, yet the chains are (except for one split piece) still intact and the roof still suits it purpose. However, I have been disappointed by the ethernit plates and their wooden substructure which declassified the lightness of the suspended roof. Stadlecky most – link, originally built over Vltava in Podolsko, CZ. There is a video of translocation and the process of rebuilding it in Stadlec here. It is unfortunatelly in Czech, sorry. More impressions of the bridge could be find here. 1740 begins the production of crucible steel, the process has been invented by Benjamin Huntsman. However, the production in similiar ovens has started in Germany in 1823, thanks to Friedrich Krupp and his mild steel. In the mean time, Henry Cort has produced puddled steel in 1784 and England has become a leader in the business for many coming years. Ueber Dachstühle von Schmiedeißen, deren Leichtigkeit, Wohlheit und Anwendbarkeit, written in October 1824, published in Mittheilungen der k.k. Mährisch-Schlesischen Gesellschaft… 12/1824, 01/1825, incl. drawing. Calude Louis Marie Henry Navier (1785-1836) has contributed a great deal to Mechanics and Analysis through his life. In 1823, he published Rapport .. etc mémoire sur les ponts suspendus in French. It is a remarkable work regarding suspended bridge constructions and their static and dynamic behaviour, it is also responsible for the boom of suspended bridges in late 1820s. The paper has been partially translated into German in 1825 by J.F.W.Dietlein (1787-1837), Berlin. The full german version has been presented in 1829 by J.G.Kutschera in a paper Bericht an Herrn Becquen und Abhandlung über die (Ketten-)Hängebrücken von Herrn Navier. So, the only way Schnirch would based his article on the Navier’s work were if he understood French, which is possible, yet not proved. The suspended bridge in Straznice has been erected as the first of its kind on the european land in 1823-24 and served till 1857(61). The first suspended bridge in steel has been builtby James Finley in 1801 in USA and the first in Europe came around 1817 – designed also by Finley. The contemporary units converted into metric system. Hi there, yeah this article is genuinely fastidious and I have learned lot of things from it about blogging. thanks.